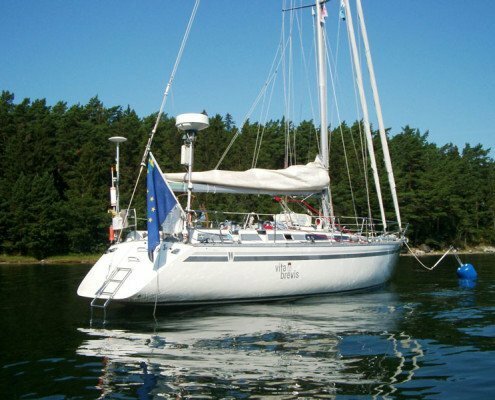 When a Wasa owner had a wish for a boat with two separate sleeping rooms with a corresponding shower and toilet, the designer, Leif Ängermark, sat at the drawing table and became Wasa 420. 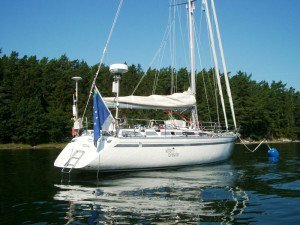 The increase by a few centimeters in length and height created a boat with more volume and a comfortable accommodation in two separate cabins as well as a large common space for navigation, cooking and socializing. As usual, Leif has maintained his basic concept with a lighter displacement and a well-balanced length/width ratio. 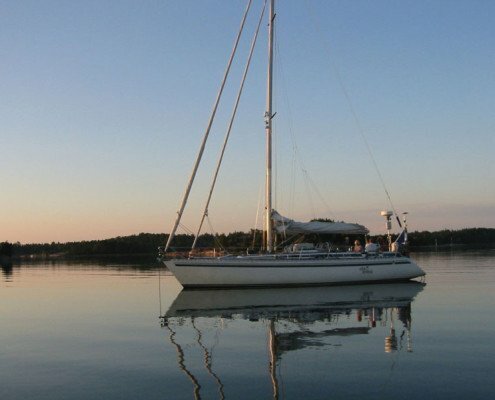 Leif prefers the more slender boats, all in order to keep what is the most important characteristics of Wasa boats; beautiful, well sailing, fast and lively. About 25 boats were built. As the Wasa 370 corresponds to the Wasa 360 -with higher freeboards- the Wasa 420 is an elevated, and slightly extended, Wasa 410. 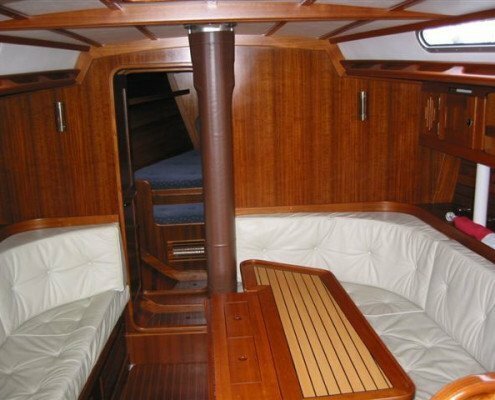 In both cases, the first models – Wasa 360 and 410 – had focused on customers who prioritized the actual sailing more than the living space below deck (in fact, the prototype of Wasa 360 barely had head room, but this was obviously changed to serial production). 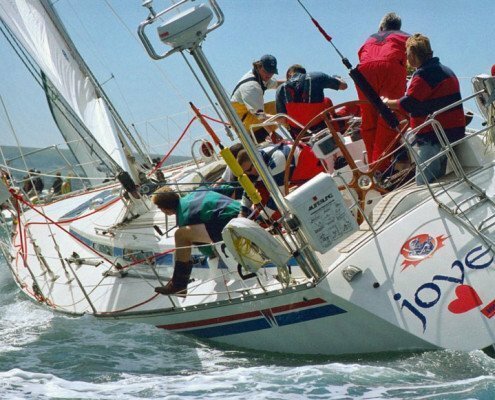 Wasa 420, that launched in 1987, is therefore almost identical to Wasa 410, apart from the increase of the freeboard and some other details. 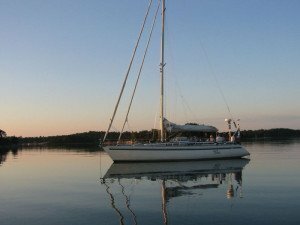 The rear of the hull was raised, the boat’s deck line was straightened slightly to provide a harmonious look. With the increase, the cockpit could be lifted accordingly, giving better room for one of the new requirements of the time: a spacious owner’s cabin. With a single large stern cabin in Wasa 420, the previous two quarter berths were abolished. 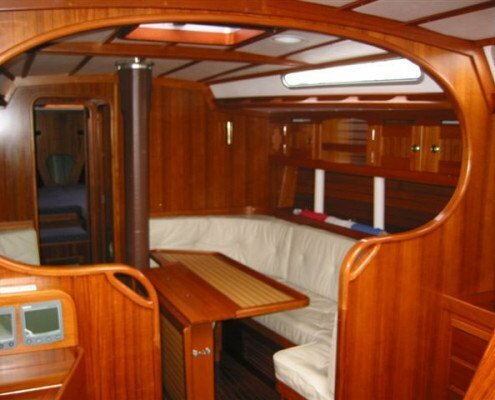 The entrance to the aft cabin is behind the navigation table on the starboard side. 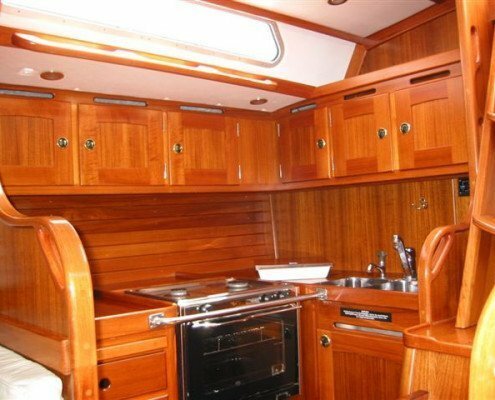 On the opposite side, the galley got its L-shape facing aft, with the double sink next to the staircase. 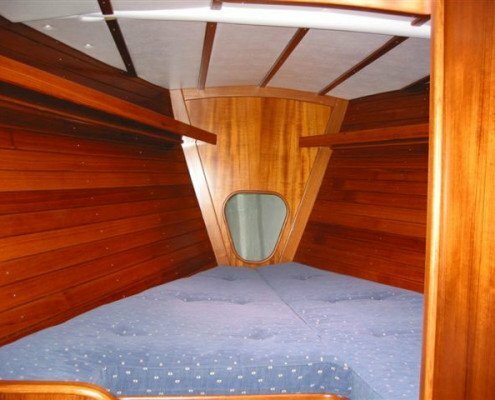 Behind the galley’s aft, transverse bulkhead -all the way in the aft cabin- is the sailor couple’s separate toilet and shower. 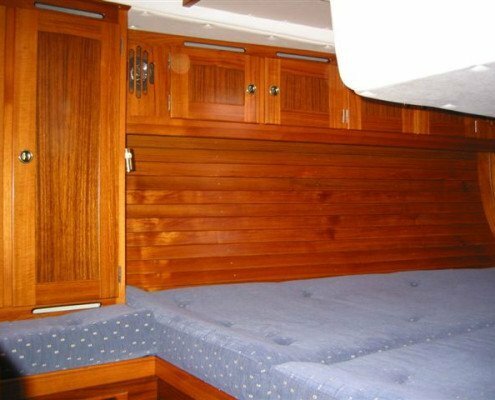 Otherwise, the interior is layed out in the same as in Wasa 410. Some detail changes were also made on the deck shape to Wasa 420. 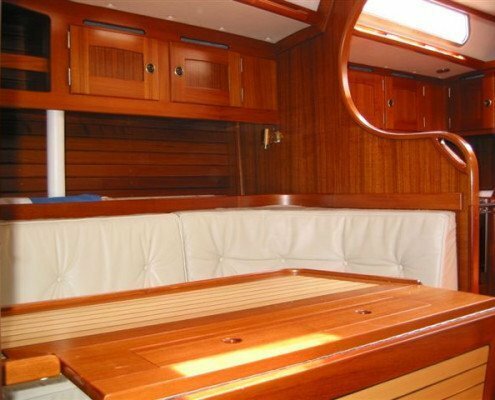 Wasa Yachts has so far manufactured 29 Wasa 420:s. The model is still produced on order.